Have you ever had a dream? Something that you always wanted to do? Or do you enjoy reading about places, the world, cycling and more? I did. Initially Blanca on a Bike was going to be mainly a way to keep in touch with family and friends. A way to be able to share with them my bicycle journey. A place to publish photos so that they could see the places I will visit and the people I will meet. I was also hoping to get something back from it. It is so amazing to hear from people when you are away. It is particularly motivating when you are having a bit of a hard time. I wanted the blog to be a central place where I could get messages and comments from everyone. And then, like so many of the things I get involved in, it grew. I began to read other people’s blogs and got a lot out of it. This made me want to give something back and develop a resource for others. Comments and suggestions to make the blog better are more than welcome. To start with during my first trip I started The Photos section which wanted to tell the story but in a different way. This section died of natural death after a while. I underestimated the difficulty of working with images having a small tablet as my only tool. I included many more photos in the blog posts instead. If you would like to follow this blog – please sing up and you will receive a notification every time I update the content and of course if you have any suggestions on how to make it better and more useful please let me know. If you would like to publish sections of this blog or photos please get in touch with me before you do so. Bianca, disfruta mucho de tu viaje!!!
? 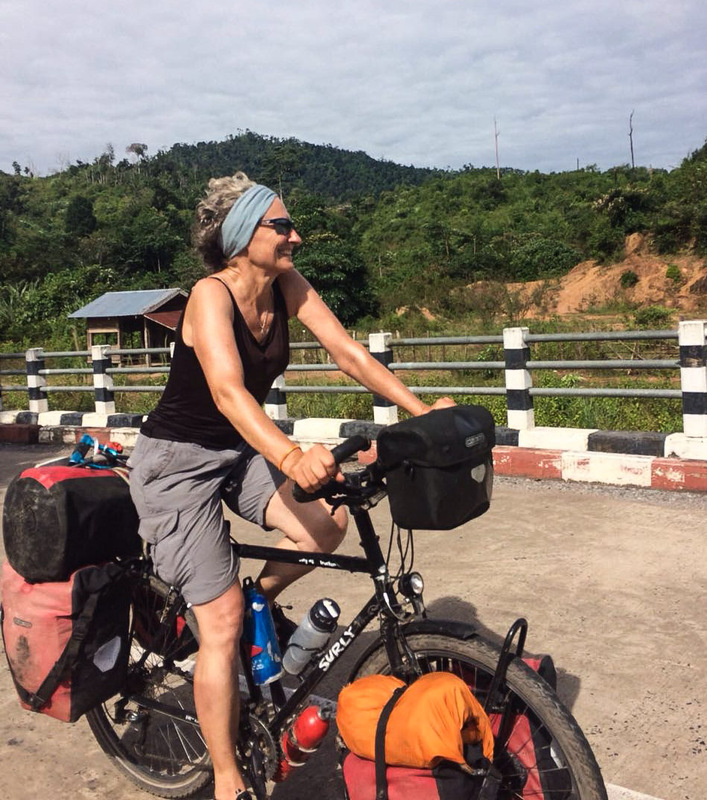 Ofcourse you take to your bike and cycle round the world. I thought I was brave cycling on my motorised Brompton to Waterloo daily. I promise not to mention it again! it must be both exciting and terrifying both for you and your girls following your exploits at home. I am so proud to know you and wish you all the very best. This has to be a book now! No hay nada que no puedas lograr!!! Tu alegría de vivir no tiene fin!!! Animo…aquí te seguimos y te acompañamos con el corazón!!! What an amazing journey you are about to embark! I will for sure be following you and waiting for your visit on this side of the world!!!! Live the dream and enjoy the ride. Great determination and loads of love will see you though the hard times and the ride. Hope you make it to the greatest place on earth Australia. What a wonderful and exciting journey you will have Blanca. I hope you have a total blast, and can’t wait to come and join you! Good Luck with your Bike Journey. Breathe deeply and enjoy it Blanca! Have a wonderful time! Wow Blanca – how did you manage not say anything about this in the Gobi Desert? A – MAY – ZING! We must definitely catch up somewhere along the way. Blanca, desejo a você toda sorte e alegria nesta nova e fantástica aventura. Ficarei acompanhando. Grande beijo!! Nice to meet you again! Y de paso saludar a Pilar. Los viejos compañeros de Alza, siempre en la retaguardia. Gracias por compartir todo esto con tanta gente. SUERTE! a la vuelta organizamos una de la cuadrilla de Alza!! Muxu handi bat!!! Titibilitibiliti… Llegó la arrancada! Muxu handi handi bat Irun-Hondarribitik. Aupa gure Txuri! is my plesaure to follow your outdoor activities. Well…sort of open ended. Watch this space!! We met in the Greenwich photography course. I wish you all the best for your trip. I am looking forward to seeing lots of pictures! Buen viaje. I hope you have an amazing journey. Stay safe! We met each other biking nearby Wageningen in the Netherlands. We think you’re so good and brave to live your dream. Our dream is smaller, we’re biking to Rome. Thanks for Some usefull information and we won’t tell anybody about your secret on your front bag :-). Back home we will folow you. Good luck from two dutch bikers. It was so nice meeting goes you on the road! Your dream is wonderful to, because I think that dreams are not big or small they are just dreams, enjoy yours! We met on the boat near Millingen. What a beatiful dream that you are fulfilling!! Wish you a wonderful journey! I wish you my best. Me he incorporado un poco tarde Espero que tu sueño se haga realidad, Muso potoloak Zarautzetik ta disfrutatu. Enjoy your big trip and see you next year. How fortunate we were to have met you on the guided walk in Plovdiv. We are excited for you and know you will have many adventures. As for us we will do what we love to do and that is walk, walk,walk. Tomorrow we will be off to Sophia on a train- a new experience for us. We look forward to following you and your bike . It was lovely meeting you too. Enjoy Sofia! You are such a lovely person and a real inspiration. It was so good to spend some time with you. I wish we meet soon again. Ezin izan nuen egon Alkizako azken bileran. Pero los amigos y amigas de la Facultad me contaban tu proyecto y no lo podía creer. Y de repente me entero que estás en Turquia!!! Besarkada handi bat eta munduko animo guztiak. Eutsi Txuri!! Espero que estés disfrutando de tu viaje y que en algún momento compartas tus experiencias y vivencias. Seguro que por donde vas pasando vas dejando una huella de simpatía y de cariño. Tú eres así, no lo puedes evitar…por donde pasas vas enciendo luces!!!! Te deseo que todo te vaya genial y cuídate mucho!!!! Y que te veamos en las fotos…me quedo muy tranquila cuando compruebo que estás genial y más guapa que nunca. Hi I cycling sometimes as well and I love to read others stories too.good trips . Te he oído por la radio y me parece súper guay lo que estas haciendo. Acabo se escuchar el programa de radio Euskadi… Me ha encantado escucharte. Te deseo todo lo mejor en tu vida y travesía. Tienes una voz que da energía de vivir.continúa así. Te acabo de escuchar por la radio y me ha encantado tu viaje. Me has removido mi suenyo tambien.Un aplauso pero que muy grande desde Bristol.Mucho animo y que sigas disfrutando del viaje. Kaixo Blanca. Irratian entzun zaitut eta zuk egiten ari zarena zoragarria iruditzen zait. Onena opa dizut zure bidaian. I would love to follow your blog ease. I’m a warmshowers host in south east australia. I hope you will visit. In the meantime I would love to read about your journey. I’m born in 1954 but you prove that age is no barrier!! Te he escuchado en la radio y tu aventura me ha parecido fantástica. Con tu alegría y tono de voz habrías triunfado en los medios de comunicación. Ondo izan. Hi Blanca, it’s Bill, we met at the hostel in Luang Prabang. I hope you are both well, great blog! How can I send you the photo I took outside the hostel as you were leaving? Albert here from UK, we met in khorg (I think) Tajikistan and went for that well earned curry! I was travelling by motorbike at the time with Charlotte my girlfriend. Well we kept to our word and sold our bike in mongolia, we picked up bicycles in Japan and have been pedaling ever since! Just finished crossing america and heading to Lisbon for a final blitz across Europe back home to Nice. I remember the nice fellow from Alaska who was with us at the time he had set off from Lisbon and I’m keen for any tips on what the best / easiest route is to get me across Spain quickly from lisbon towards Barcelona (I need to be home by Xmas!). Do you have his contact details, sorry for such a long message and of course if you have any tips too! I’m scouring the net but not finding much info on Spain routes… My email is ponnelle2002@yahoo.com. your blog is amazing, with our trip coming to an end soon I am super jealous of you!!!!! Finally signed up to your blog, I think Ed will be pleased I am not constantly quizzing him to see what you are up to! Love seeing what you are up to. How blooming amazing. Still walking in 3 days a week all thanks to you Blanca. Oh, got married hence the surname being Tobin and not Reeves. all the very best, will keep checking in you inspiration you!!! Such a privilege to have met you at the Hihhlands Hotel in Vietnam (as well as getting to share some chicken and rice with you). You’re an amazing lady and so lovely! Fantastic blog too! Stay safe on your travels and good luck. It was lovely meeting you at Harry Perry Bikes, Woolwich the other day. You made us all realise that we are all human but just have different manifestations in a spectrum of colour. What a special times we live in and to cherish every moment and be. We met in last march in Hoï Ann, sleeping in the same guesthouse. We talked together during breakfast. You were making your own coffee. How much you look strong on your bicycle traveling all around the world. How are you? Are you still on the road? You are a star in our souvenirs. Hola.No nos conocemos.comprartimos una amiga mientras estuvo con nosotras. siempre he tenido noticias tuyas por ella.espero que podamos conocernos algún día. Will be in touch soon and hope to see you in a month or two. This is Mohamed, we met today at the Zaafarana on your way from El Ein El Sokhna towards Ras Ghareb. I hope enjoyed a good sleep there and that you continue your trip successfully and enjoyably. Please keep in touch if you need any help as long you are in Egypt. Millions of thanks again. Enjoy your big and powerful bike!! Thank you very much for helping me out. I really appreciate it. Dear Blanca, I was so happy to meet you very briefly at that place in Makuyu ! What a coincidence to meet a basque neighbor in the middle of Africa! I know – What are the chances!!!!!! Blanco, this is an amazing trip. Am so happy for you and your effort to make a difference.. Am privileged to have met you in Eldoret when it was flooding. Blanca, this is an amazing trip. Am so happy for you and your effort to make a difference. Am privileged to have met you in Eldoret when it was flooding. Blanca, this is an amazing trip and am so happy for you and your effort to make a difference. Am privileged to have met you in Eldoret when it was flooding..
cycling Uganda was inspirational! The people , the wildlife, the trees , the plants, flowers , birds . The landscape. Not just an expert bike engineer, a few other skills to name . Thanks for the good times . Will deliver all your hugs as promised . Hola Blanca saludos desde Colombia . Te deseo mucha suerte y salud en tus viajes!!! Dear Blanca… wishing you swift and safe passage to Cape Town tomorrow…don’t accidentally end up doing the Cape Cycle Tour with the other 35,000 (ha ha)…. I was inspired by your journey and thrilled to have met you..